One of the benefits of having a tree surgeon for a housemate is the amount of free wood available. I’ve always wanted to do something with it but was held back by a lack of inspiration or restricted by the size and type wood available. However, with my girlfriend’s birthday approaching I decided to make some small jewellery boxes carved from some juniper that was available. The next stage was to sand them down, finish them with bees wax and fit some hinges and latches. My Dremel made light work of sanding down the inner edge, but getting to the bottoms was a problem. 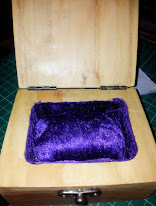 To get around this, since these were going to be jewellery boxes, I decided to line the inside with velvet and sew a small cushion to sit inside. I had to make a number of boxes, since not many survived the process. Although the wood had been weathered for a few months the boxes that came from wood closer to the centre of the log were still wet and would split as they dried. Others split while being chiselled or from being dropped. However, from squaring on the bandsaw to being chiselled out it only took around half an hour and with the number of blocks I had to use it was easy to produce a load of them and pick the best of the survivors for finishing. I’d like to make some more things with the wood left over from my housemates job. In future I think that the logs will need more weathering/drying time before working with them. I’m always on the lookout for inspiration, so let me know your ideas in the comments below. ~ by Jay on April 7, 2015.